ENGINEERING. PRACTICE. POLICY. 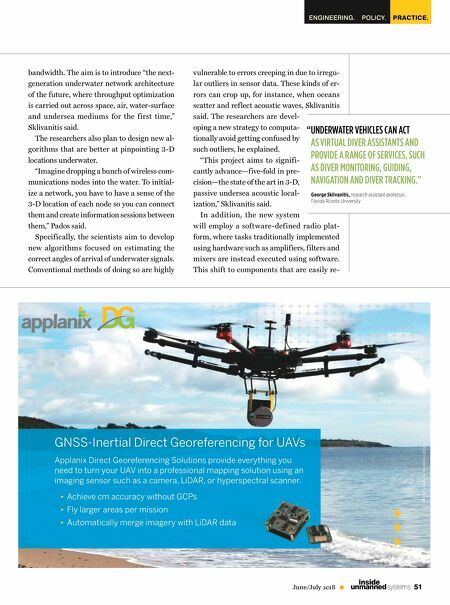 51 June/July 2018 unmanned systems inside bandwidth. The aim is to introduce "the next- generation underwater network architecture of the future, where throughput optimization is carried out across space, air, water-surface and undersea mediums for the first time," Sklivanitis said. The researchers also plan to design new al- gorithms that are better at pinpointing 3-D locations underwater. "Imagine dropping a bunch of wireless com- munications nodes into the water. To initial- ize a network, you have to have a sense of the 3-D location of each node so you can connect them and create information sessions between them," Pados said. Specifically, the scientists aim to develop new algorithms focused on estimating the correct angles of arrival of underwater signals. Conventional methods of doing so are highly vulnerable to errors creeping in due to irregu- lar outliers in sensor data. These kinds of er- rors can crop up, for instance, when oceans scatter and ref lect acoustic waves, Sklivanitis said. The researchers are devel- oping a new strategy to computa- tionally avoid getting confused by such outliers, he explained. "This project aims to signifi- cantly advance—five-fold in pre- cision—the state of the art in 3-D, passive undersea acoustic local- ization," Sklivanitis said. In addition, the new system will employ a software-defined radio plat- form, where tasks traditionally implemented using hardware such as amplifiers, filters and mixers are instead executed using software. 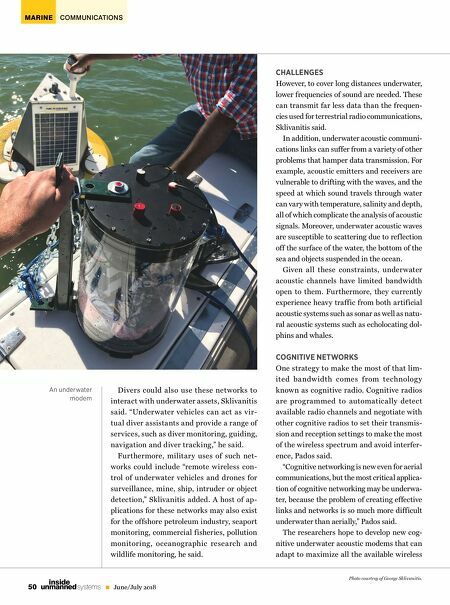 This shift to components that are easily re- " UNDERWATER VEHICLES CAN ACT AS VIRTUAL DIVER ASSISTANTS AND PROVIDE A RANGE OF SERVICES, SUCH AS DIVER MONITORING, GUIDING, NAVIGATION AND DIVER TRACKING." George Sklivanitis, research assistant professor, Florida Atlantic University GNSS-Inertial Direct Georeferencing for UAVs Applanix Direct Georeferencing Solutions provide everything you need to turn your UAV into a professional mapping solution using an imaging sensor such as a camera, LiDAR, or hyperspectral scanner. ► Achieve cm accuracy without GCPs ► Fly larger areas per mission ► Automatically merge imagery with LiDAR data © 2018, Trimble Inc. All rights reserved..